To restore species-rich grasslands on former agricultural land, typically phosphorus-poor soil conditions need to be re-established. Here we assess the potential of phosphorus extraction by biomass production, i.e. phytomining. We compare two techniques: (i) ‘mowing’, i.e. cutting and removing hay two or three times a year, and (ii) ‘P-mining’, i.e. mowing with yield maximization by adding growth-limiting nutrients other than phosphorus (i.e. nitrogen and potassium). In a five-year field experiment at three fields situated along a soil phosphorus gradient, we studied phosphorus removal through both biomass assessment and changes in two soil phosphorus pools: bioavailable phosphorus (POlsen) and slowly cycling phosphorus (POxalate). 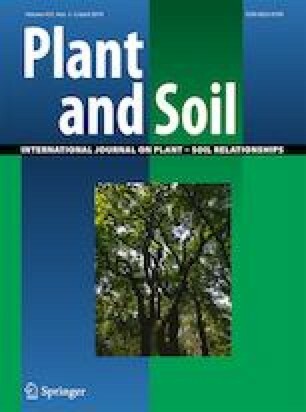 Phosphorus-mining doubled the phosphorus removal with biomass compared to mowing, and phosphorus removal with biomass was lower at fields with an initially lower concentration of POlsen in the soil. The POlsen concentrations decreased significantly during the experiment with the largest decreases in phosphorus-rich plots. Changes in the POlsen and POxalate stocks were correlated with the amount of phosphorus removed with biomass. Phosphorus-mining effectively increases phosphorus removal compared to mowing, but becomes less efficient with decreasing soil phosphorus concentrations. Restoring phosphorus-poor soil conditions on formerly fertilized land remains a challenge: phytomining most often needs a long-term commitment. The online version of this article ( https://doi.org/10.1007/s11104-019-04049-2) contains supplementary material, which is available to authorized users. We are grateful for the admission to conduct our field experiment in Landschap De Liereman (Natuurpunt): the cooperation with the people of Natuurpunt and local farmers was greatly appreciated. Special thanks to Kris Van der Steen, Jan Van den Berghe and Dieter Dijckmans. Further, we thank our lab technicians Luc Willems and Greet de Bruyn for processing and analysing our samples. Kris Ceunen, Filip Ceunen, Luc Willems, Robbe De Beelde, Jelle Van den Berghe, Danny Vereecke and Tomohiro Nagata are thanked for helping with fieldwork. Lander Baeten and Haben Blondeel are thanked for helping out with the statistics. We thank Rob Marrs, Tobias Ceulemans, Frank Nevens, Lander Baeten and three anonymous reviewers for their helpful comments.